It turns out that the dolphin had fishing line and a hook stuck on one of its fins, so it approached a group of divers who were watching manta rays at night near Kona, Hawaii. Fortunately one of the professional divers was able to help remove some of the fishing line that was restricting the movement of the dolphin, though in the end they were unable to remove the hook. Darth Water from Mutlu Payaslıoğlu on Vimeo. Thanks to Mutlu Payaslıoğlu for this great video. South west to the port of Sığacık, this dive site is 30 min. away from the center. As the name suggests, this site is the heart of the marine life around the region. Depth; 5, 15, 25, 35, 45 m. multilevel tables. South west to the port of Sığacık, this dive site is 25 min. away from the center. May be the best dive point for all level divers. Very rich in aquatic life. Depth; 5, 15, 25, 35 m. multilevel tables. South west to the port of Sığacık, this dive site 25 min. away from the center. 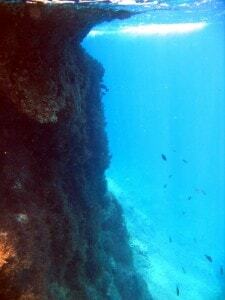 Small cavern is full of soft sponges and lacy corals. South west to the port of Sığacık, this dive site is 20 min. boat trip to the center. Very good point for newbies and starters. Many groupers and crustacaens can be seen. South west to the port of Sığacık, this dive site is 20 min. avay from the port. A small fisherman’s boat was caught in the storm and wrecked on the reef. Groupers, murray eels, barracuda and amberjacks can be seen seasonally. As part of the artificial reef project this coast guard wreck was sunk in 2009. The boat was donated by the Turkish navy. This steel boat has a lenght of 22 m. and beam of 8 m.
Depth; Bow 20 m. Stern 16 m.
South west to Sığacık, 10-15 min. to the center. This wreck is an old Greek mosquito craft which has a length of 18 m and a height of 7 m. The boat sank in 2002 as she was towed to the ship dismantling facility in Aliağa. During this time quite a lot of marina life was gathered around this artificial reef. During July and August of 2012, Exploration Vessel Nautilus will carry out an expedition to explore the Black Sea, Aegean Sea and Mediterranean Sea off the coasts of Turkey and Cyprus. Our rotating Corps of Exploration aboard Nautilus will be mapping the geological, biological, archaeological and chemical aspects of these regions to depths of approximately 2000 meters. During the expedition, we will be sharing our discoveries live on the web via telepresence technology, putting the unexplored ocean directly in your hands. I’m kneeling in the squishy sand at the bottom of the Aegean Sea, three metres above my head the pale grey surface is lit with slanting sunlight, a small Bream is swimming bossily through the fat bursting bubbles in front of my mask and I’m reciting Tolkien to myself. Fethiye Mexican Hat from Lütfü Tanrıöver on Vimeo. Thanks to Lütfü Tanrıöver for this great video. Diving Turkey from LÜTFÜ TANRIÖVER on Vimeo.